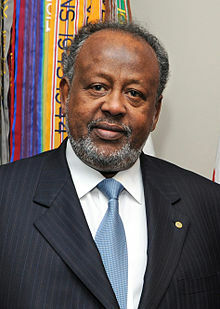 Ismaïl Omar Guelleh (Somali: Ismaaciil Cumar Geelle. Arabic: اسماعيل عُمر جليه) (born 27 November 1947) is an Djiboutian politician. He became the President of Djibouti in May 1999. ↑ Biography at Presidency website (French). This page was last changed on 11 August 2014, at 00:33.